The area consists of four parks that may appear to be one very large community. These include: Florence Gardens (Manufactured Homes only) , Caliente (RV's only), Casita Hermosa and Vista Hermosa (Condominiums only) and Tierra Del Sol, RV's. In every park, the home owner owns their lot. We are located on the north end of the historic town of Florence on highway 79. Residents of Florence Gardens enjoy a resort lifestyle subdivision. This golf course community near the beautiful Pinal Mountains beckons to people who are searching for a friendly active adult community that is luxurious yet affordable and out of the crowds. 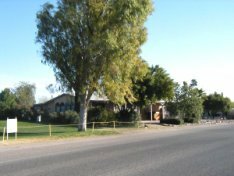 Florence Gardens is only 28 miles southeast of Apache Junction and the Mesa area, yet it maintains a rural ambiance. Residents breathe clean fresh air and are surrounded by the beauty of the lush green golf course, the high desert and majestic mountains. Florence Gardens' 15,000 square foot clubhouse is a gathering spot for residents and their guests. A dance floor, pool tables and craft rooms give residents plenty of recreation options. There's always something going on at the clubhouse that encourages neighbors to get out and meet one another, such as pancake breakfast, pot luck dinners, bingo games, dance lessons and much more. A landscaped courtyard with two sparkling swimming pools and spas provide a place for residents to relax and enjoy new friendships. The price of the lot and home can also include the home installation, sidewalks and driveways, storage sheds, double carports or garages, patios, heat, A/C unit and landscaping. We have over 40 floor plans to choose from, there's a home for just about any size and lifestyle. 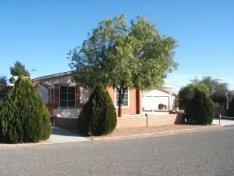 Florence Gardens Sales Office is located at 750 E. Gila Drive in Historic, Florence, Arizona. 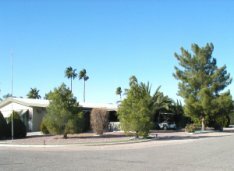 Check us out completely here on this site and then come see us or call 520-868-4092 or toll free at 888-289-4810. You'll be glad you did. Click here to view a large map of the Florence Gardens area, notice the location of the Florence Gardens Sales Office (right at the entrance). Run a search using any major search engine such as: Google, Ask, Yahoo, Others, for anything related to Retirement in Florence, AZ such as "homes" or "community". You'll find florence-gardens-sales.com within the Top Ten and often listed first (after the ads but at times, above the ads).